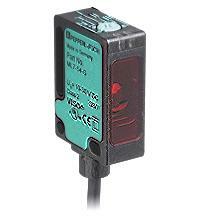 Retroreflective photoelectric sensors have an emitter and a receiver in the same housing. Retroreflective sensors require a quality reflector to reflect the light beam back to the sensors receiver. The output is triggered when the target object breaks or interrupts the light beam. Control Components is an authorized distributor for full line of Balluff, Pepperl+Fuchs, IDEC, and Carlo Gavazzi retroreflective sensors.